So, I started Camp NaNoWriMo yesterday. I and a few friends have a cabin (which is basically a private chat group for up to 12 people who have set up projects). Camp NaNoWriMo is similar to the full fledged National Novel Writing Month, but it’s meant to be a bit more low-key and flexible. You get to set your own word count goal, for one. Lots of people use Camp NaNo to edit or revise a large project (such as whatever they wrote during a previous NaNoWriMo). It’s fun. I like having the private chat and having a structure for posting progress, getting and giving encouragement to friends, and so on. Our cabin isn’t full, so if something like this appeals to you, set up a project and send me a message with your user name so I can send you an invitation to our cabin. My particular project is an editing one, and I’m counting words as I go through scenes in the larger project. When I finish the edits on a scene, I copy it into a seperate Scrivener document to keep track of my word count. I was a little suprised at how much I got done on the first day, since it was a day at work where I don’t really get a chance to take a full lunch to spend writing, and I was feeling more than a bit out of it when I got home from work. In other news, the 2019 Hugo and Campbell Awards Finalists have been announced. I was quite pleased to see that in every category at least one thing I nominated made it to the final ballot. The flip side of that is that there are also a lot of things with which I’m not familiar that made it onto the ballot, so I get to read a lot of new stuff soon! I was really happy to see that Archive of Our Own—a massive fan fiction repository—is nominated in the Related Works category. It’s a little weird, because there are thousands of contributors (including me, though I have such a teeny tiny bit of stuff posted I don’t really count). Clearly if it wins, thy won’t be handing one of the big rocket trophies to every contributor. There are a couple of things in that category that I haven’t read, so I don’t yet know if AO3 is going to be my first choice for Related Work, yet. As I said, I’m once again looking forward to reading stuff that has been nominated for the Hugos. As happy as I am to see things I nominated make the list, I also love seeing new things that I haven’t read, yet. Because, as I mentioned as part of another point last week, no one’s favorites list can encompass all of science fiction/fantasy. And that isn’t just because a whole lot of it is being published today (although with self-publishing being so much easier, and the internet making things more discoverable, there is an incredibly wide variety to choose from). But a lot of people operate under the illusion that in times past a single fan could, indeed, read everything in the genre that had been published that year. It only seems that way if you assume that only the authors and stories you have heard of years later are who and what were being published at that time. A great example of this misapprehension is one of the flaws in a recent blog post by whacko Brian Niemeier (that I won’t link to directly, but since Camestros Felapton does a nice analysis of some of the flaws, I’ll link to his post: Did fandom cause the collapse of civilisation or vice versa? Let’s Assume Neither 🙂). Niemeier makes the claim that “back in the day” everyone read Edgar Rice Burroughs and everyone listened to The Shadow radio show. Now, it’s true that Burroughs’ Tarzan books sold so well that he was able to form a film company and produce his own adaptations of his books, something that would be unthinkable for an author to do today. But it’s simply not true that everyone read the Tarzan books, if for no other reason that regular readers of novels and the like have always been a minority of the population. James Branch Cabell, a contemporary of Burroughs, sold more copies of his books during the nineteen-teens and -twenties than Burroughs did, yet he is largely forgotten today. There were scores of magazines publishing sci fi, fantasy, horror, and related fantastical fiction, publishing thousands of stories during that time most of which written by hundreds of authors many of whom we’ve never heard of. While there is a huge amount of fantastic fiction to love now, there was a huge amount then, too. And I think that’s great! Because not everyone likes the same things, and the more variety there is, the more likely that there is something wonderful to discover and read for the first time, right? Similarly, the fact that many people like many things, mean that something you or I create is likely to find a receptive audience. 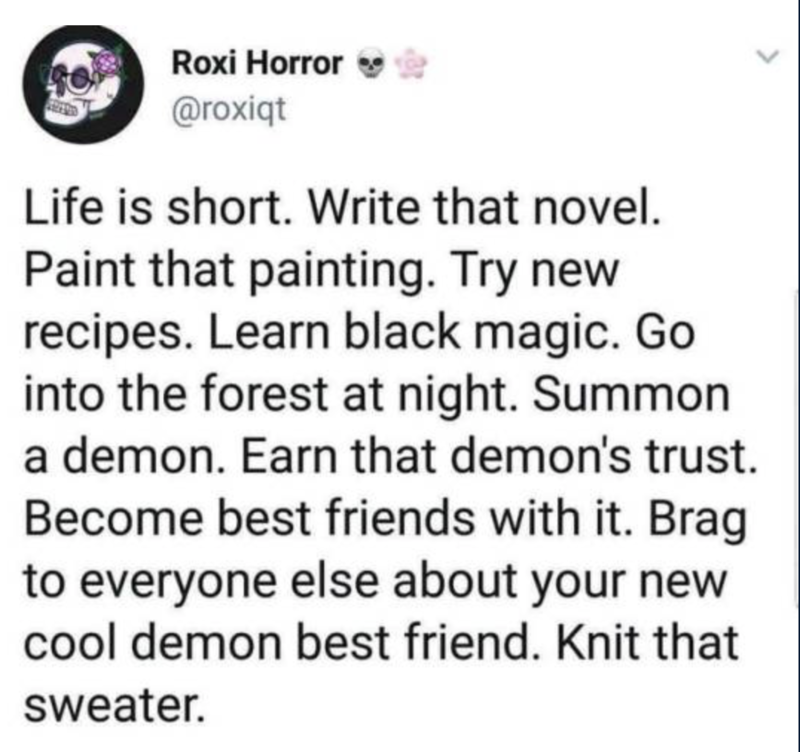 I am quite certain that if someone wrote a story about a conjurer who becomes best pals with a demon and they take up knitting together, someone out there will want to read it. And those are good things.